We have a couple of little secrets to share with you. The first one is that the reason people skydive has a lot more to do with celebrating life than it does with defying death. The second little secret is that the reasoning behind skydiving is pretty similar no matter who you’re talking to: the guy who flies a Technicolor wingsuit around a thousand dizzying YouTube videos, or the lady with six grandkids who goes out to the local dropzone to celebrate her 80th birthday with a first-time tandem jump. Intrigued? Here’s the deeper story behind the motivations for skydiving. Skydiving is probably the most empowering thing you’ll ever do in your life, hands-down. Once you do it, you’ll be changed forever. After all, you’ll know that you can face the scariest situation imaginable–more than 10,000 feet of empty air yawning wide open between you and the ground!–and literally laugh (okay: scream-laugh) in its face. The superpowers you discover up there will change the way you look at literally every other challenge in your life. For an activity that rarely takes more than a few hours of your time, the return on the resources invested in a skydive is incredible. You’re sure to be amazed by how powerful a mood-lifting, confidence-crystallizing “therapy” it is. You’ve never had fun like this before. You’ve had fun before. We know. However: A skydive isn’t “normal” fun. A skydive is to “normal” fun like a Formula-1 ride-along is to your morning commute; it’s in a totally different category. It’s so beyond most first-timers’ expectations that it blows some folks’ minds completely. They land and decide right then and there to become full-time skydivers. Even more often, we’ll see first-time tandem students walk right back to Manifest from the landing area and sign up for the course to earn a solo skydiving license. Plenty of those freefall-infatuated jumpers end up spending every weekend with us, soaking up the high-altitude sun and making memories that most people can’t imagine in their wildest, wooliest dreams. …And that brings us to the deepest reason that people skydive: The community. 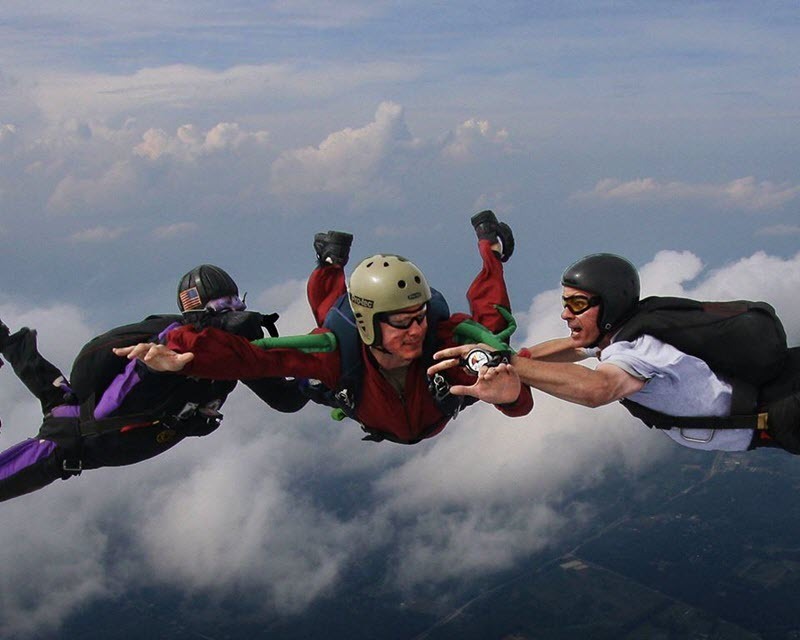 Kinda like surfing, or yoga, or rock climbing, skydiving isn’t just about the activity. It’s not just about falling down and opening a parachute. Our beloved sport has a profound philosophy all its own–a lively community support network–a focus on getting forever stronger, more agile and more skilled. Skydivers are united under that banner and form a uniquely inclusive worldwide family. All that said: Everybody’s different. Every new jumper takes to the sky under the prodding of her own personal motivations. If you’re reading this, you probably have a reason or two egging you on. Why don’t you let them take the lead? There’s so much to discover.